It might have happened with you that your masterpiece Apple I phone might have been compared with other mobile phones whose sound output is higher. You also might have felt a bit on your colleague’s comment but not anymore as we will help you in increasing the volume level of your I phone by almost 50 to even 100 percent, so that you too can play it loud with your Apple I phone. After all, you deserve playing it loud as you have spent a lot in owning this masterpiece. The sound output has been an issue as despite playing music on full volume it’s not loud enough. No, we will surely NOT discuss here about any 3rd party soft wares nor any application which will help you boost the volume up. 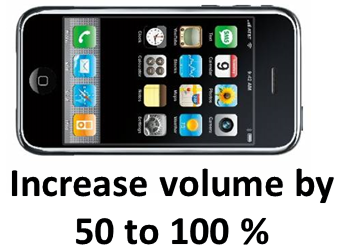 We will just provide you with a trick with which 50 to 100 % volume increase can be achieved. We also know that there are quite a few soft wares in the market which I think didn’t make any significant changes in the volume increase than a hype. All you will be requiring in the process to increase the volume from your Apple I phone will be a needle or a clothespin, bit of a courage, patience and determination as well to achieve the goal of increasing the volume of your Apple I phone. 1. Firstly, what you can do is to record the full volume played by your Apple I Phone which will help you to make a note of the present volume level and don’t try to remember the audio levels as it’s practically impossible to remember such things. 2. Now, bring your courage and determination together, take a needle or a clothespin and gently poke into the speaker holes of your I phone, kindly note, speaker is located just below the home button, on bottom left. Don’t poke deep, just poke it gently till you can feel that it has penetrated into the material. 3. Now, no more steps as you have successfully completed the procedure and you can now check the maximum value and can compare with the same with the recorded one which is mentioned in step 1 above.